Pilkington Pyrostop® is a clear, laminated, fully insulating fire-resistant safety glass that offers the highest level of fire protection while effectively blocking the transmission of conductive and radiant heat, and maximizing natural light and visibility. Pilkington Pyrostop® is designed for interior and exterior use where thermal protection is officially required in the case of fire up to class EI 180. Available for use with steel, aluminium and timber frames as monolithic types or Insulating Glass Units. Pilkington Pyrostop® is ideal – vertically installed – for use in transparent fire walls, windows, doors, screens, partitions and facades or – inclined installed – for roof glazing (special type) and horizontal glazing (special type). 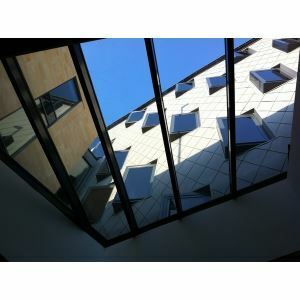 Today, large areas can be glazed using fire rated glass for doors, partitions, lot lines, atriums, stairwells, storefronts, floors and roof facade elements allow fire safety designs in buildings flooded with daylight. Pilkington Pyrostop® replaces opaque constructions which excluded daylight and rule out such spacious and impressively open architectural design options. Available in monolithic or Insulating Glass Unit form.